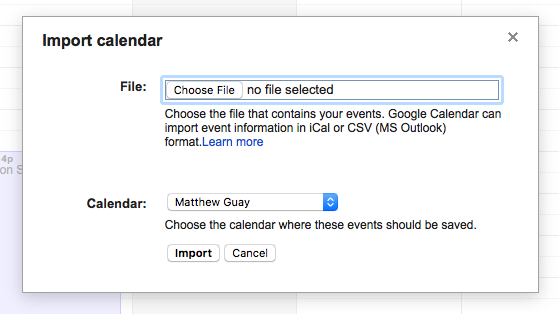 Importing Google Calendars works much the same. Just open calendar.google.com, then tap the down arrow beside the Other Calendars list on the sidebar, and select Import Calendar. You can then select your calendar export file, and choose which of your calendars you'd like to add the imported events to. If you want them in their own calendar, go back and make a new calendar from the menu beside the My Calendars list, and then import the old calendar to that calendar you just created.